A community of 13 townhomes existing since 2007. The property includes a "common house" and garden. The homes are passive solar and have other green building features. The members acted as their own developer, entailing considerable commitment of time and money. Homes are affordable for our area. 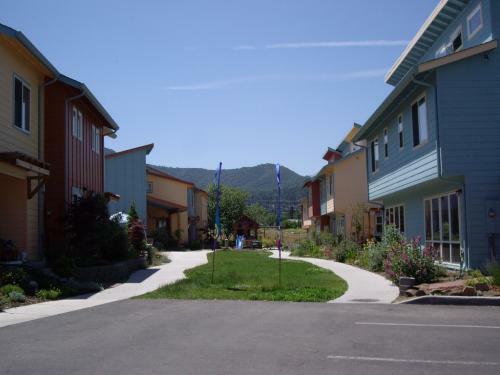 Located one mile from downtown Ashland near parks, schools, and a bike path, this is in-town housing in a small town. We started with several families with young children, as well as single and older members and have a new crop of young children along with older kids, parents and single adults. Biographies are available on our website, along with a values statement and other tidbits. Homes range from one to four bedrooms and all have small private yards. All homes have many south-facing windows, passive ventilation, radiant heat, and superior insulation. Many fruit trees and herbs are in the landscaping. We worked on this project for four and a half years. Since we acted as our own developer, all members contributed substantial time to the project. We practice facilitation and group process skills and are committed to practices of clear communications, caring about each other, and having fun. As a small community, we place a premium on getting to know people before they become members. In the event a home goes up for sale, we maintain a list of interested buyers for sellers to use. We seem to have homes for sale on a fairly regular basis as folks come and go from the Ashland area.